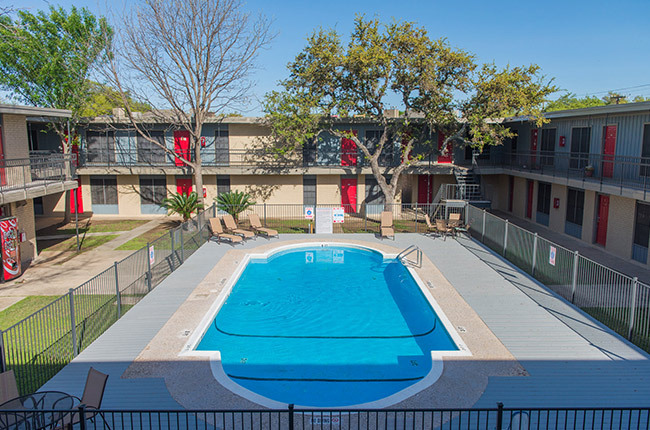 If you’re seeking conveniently located, newly-renovated apartment homes, look no further than Hamilton Place Apartments in San Antonio, Texas. Featuring beautiful floor plans that range in size from studios to four bedrooms, there’s simply no better place to enjoy relaxing, residential living than our pet-friendly apartment and townhome community. We provide an extensive list of amenities, designed for supreme comfort including upgraded interiors, new kitchen appliances, spacious living rooms and bedrooms, and large walk-in closets. Step outside your apartment and discover our extensive suite of shared features such as a resort-style swimming pool, two laundry facilities, children's playground, covered parking, and more. You’ll also love being within driving distance of several local schools, shopping centers, and restaurants. Experience the comfort and convenience of Hamilton Place Apartments, the epitome of affordable, maintenance-free apartment living in the Alamo City.